City Slicker Farms and the perks of being a landowner. 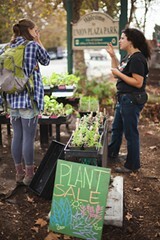 City Slicker Farms' sliding-scale farm stand. Staff members at City Slicker Farms like to tell the story of the West Oakland nonprofit's early days, when volunteers would farm a half-dozen plots of land with a single set of tools, and tote water from site to site via bicycle because some of the locations didn't have a water hookup. For the first time in its fourteen-year history, City Slicker Farms is now a landowner. 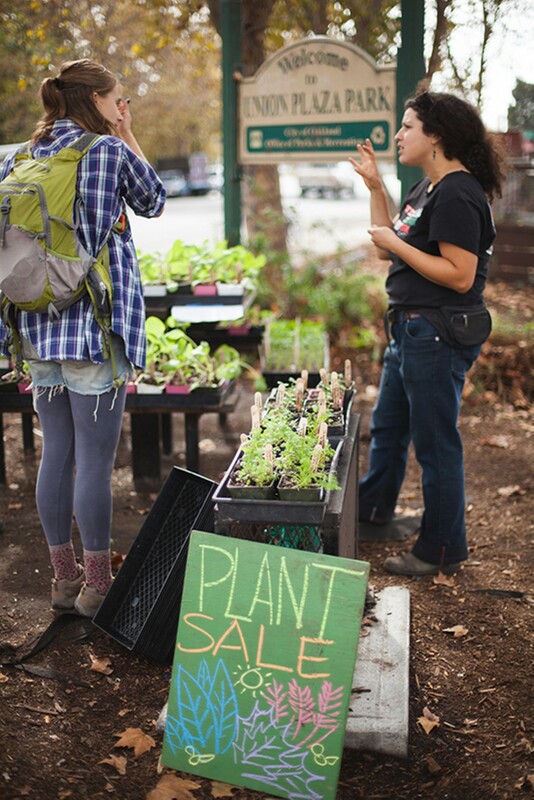 That may not seem like a big deal, but according to City Slicker Interim Executive Director Ariel Dekovic, it's hardly the norm for Bay Area urban farmers, most of whom depend on some kind of benevolent — but ultimately temporary — partnership with a public or private property owner. And, of course, this is one of the subtexts behind several high-profile cases of "Occupy"-style guerrilla gardening, in which activist farmers have taken over vacant lots and squatted on them. 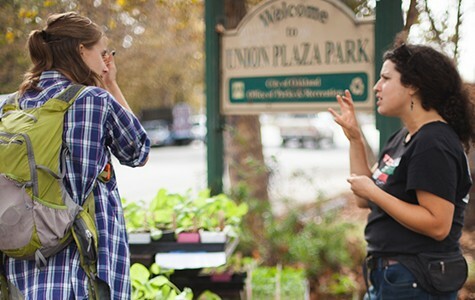 For many urban farmers, even a small plot of land is just too expensive to buy. But thanks to a $4 million state grant it received in 2010, City Slicker Farms was able to purchase an empty West Oakland lot that has, at various points, housed a junkyard and a paint factory. Now that the soil has been cleared of toxins, the farm's supporters are ready to begin construction in earnest — and for the first time they're making plans without worrying that they'll be forced to move again two or three or five years down the road. Dekovic estimated that City Slicker itself has farmed on at least ten different sites over the course of its history, and at each site, staffers have eventually had to dig up their garden beds and move them someplace new. And even though all of those arrangements were friendly and mutually beneficial, the lack of permanence made it difficult to make long-term plans, or sink a lot of capital in an ambitious construction project. "In the end, if you don't own the land, you don't get to decide what happens to it," Dekovic said. Among other planned features, the new farm will likely include a greenhouse, a fruit tree orchard, and a community garden at which local residents who don't have their own garden can maintain a small plot. One of City Slicker's broad goals is for the farm to be an educational hub — a place at which amateur urban farmers of all ages can come to learn about topics such as beekeeping and carpentry. The farm will also double as a beautiful public park — complete with a playground for kids — that will be open every day from morning to night. To help pay for all of this, the organization has launched a $25,000 crowdfunding campaign on Barnraiser.us. When taken in combination with the nonprofit's three existing farm sites, the new location should allow City Slicker to double its total production, Dekovic said. And that, ultimately, is City Slicker's mission. "At the end of the day, we want to put a dent in hunger and lack of access to nutritious food," explained Ernestine Nettles, a member of the neighborhood council that has helped plan the new farm. Nettles, a lifelong West Oakland resident and avid gardener, said that in the Fifties, her parents fed people with vegetables from their backyard. Back then, she said, all her neighbors knew how to garden. Everyone grew their own onions, garlic, carrots, and mustard greens, and the kids all knew who had the sweetest plums or apricots — "who had the sweetest everything in West Oakland." That's the kind of culture — in which growing your own healthy food is just a normal part of life — that Dekovic and Nettles would like to see make a comeback in West Oakland. Hopefully, just like the new City Slicker farm, that can be a change that's permanent.